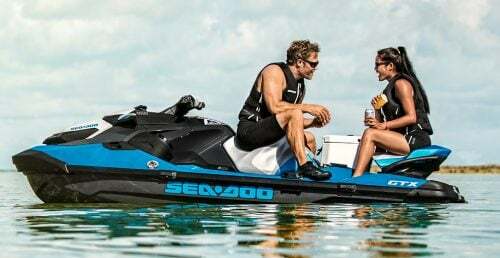 While it doesn’t look all that different on the outside, the 2018 Sea-Doo RXT-X 300 features a host of upgrades you will appreciate. 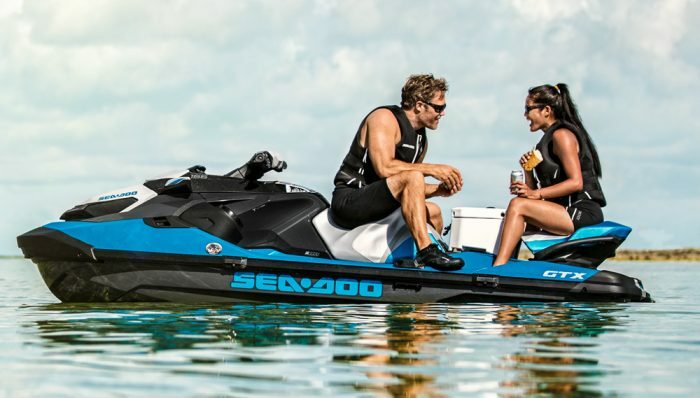 With eye-catching details like a radical new storage concept, modular seat design, available Bluetooth sound system and a variety of aft cargo possibilities hogging the spotlight, Sea-Doo almost buried the lead when it comes to the new RXT-X 300 – that the sporty craft (as well as all GTX/RXT-based models) was sporting a completely new hull and deck for 2018. Extra, extra…read all about it. Say goodbye to the RXT platform as we’ve come to know it. While the new craft is reminiscent of the design that came before in terms of exterior styling, its noticeably more low slung and features plenty of change below the waterline. The latter begins with a new ST3 hull more reminiscent of the RXP’s T3 configuration at the keel. Deadrise is a sharp 22 degrees, aimed to increase the hull’s wave penetration and provide comfort and control in rougher conditions. Strakes are designed around keeping the boat steady in chop, as well as track straighter in offshore environments. Opposed to the previous design, the hull’s first chine is hard, again to give stability in heavy conditions as well as predictability in turns. A second chine, which juts abruptly out from the hullside just in front of the sponson, adds a 1/2” of width to each side to enhance stability at rest, as well as improve high-speed control in rough waters. As to that lower profile deck, it positions the saddle 1.4 inches lower than the previous design; passengers are dropped a full 3.0 inches. Footwells are also deeper and wider, the overall goal, as stated in our first look review, to lower the craft’s center of gravity. Overall dimensions are actually shorter by a full 3.3 inches, yet 1.2 inches wider across the beam. 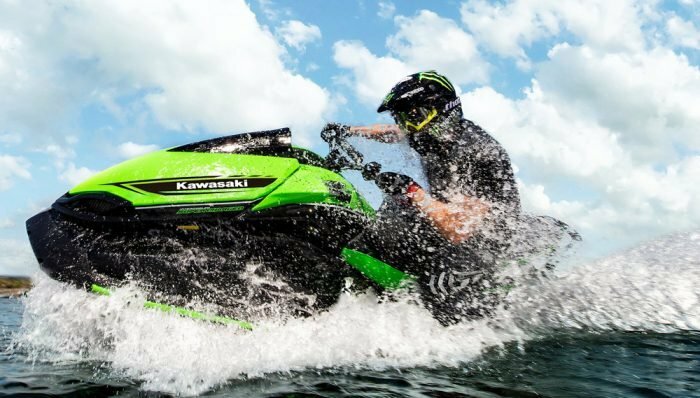 Weight has dropped by a full 86 pounds, significantly improving the craft’s power-to-weight ratio. And yes, it’s quite stable; you can even board the craft from the side. Still, the most eye-catching change above is to storage. 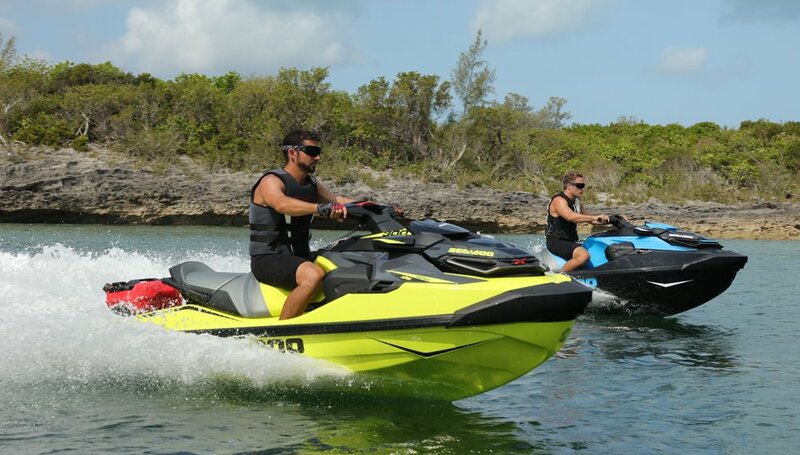 Gone are the days of stretching out over the handlebars and reaching to access a deep front storage locker without taking water over the bow or losing your balance and ending up in the drink. Now, reach just forward of the saddle, pull up two catches with both hands and lift. The entire steering assembly (and glovebox) lifts on a gas strut to reveal stowage directly in front of the seated driver. Yes, on paper its capacity is significantly less than the previous model, a mere 27 gallons compared to the former’s 42.8. In practice, however, the storage seems quite spacious and far more practical given the fact that items stay within easy reach, especially if you hit up the accessories division for handy storage dividers. Did I occasionally get annoyed having to lift the entire assembly when I wanted to simply toss in a water bottle? Yes. The small glovebox now primarily houses a watertight, shock-absorbing case for the ever-present smartphone, with spare room for little else. But overall, the design works and works well. I was also admittedly shocked by how solid this entire piece felt, with little-to-no play or wobble. 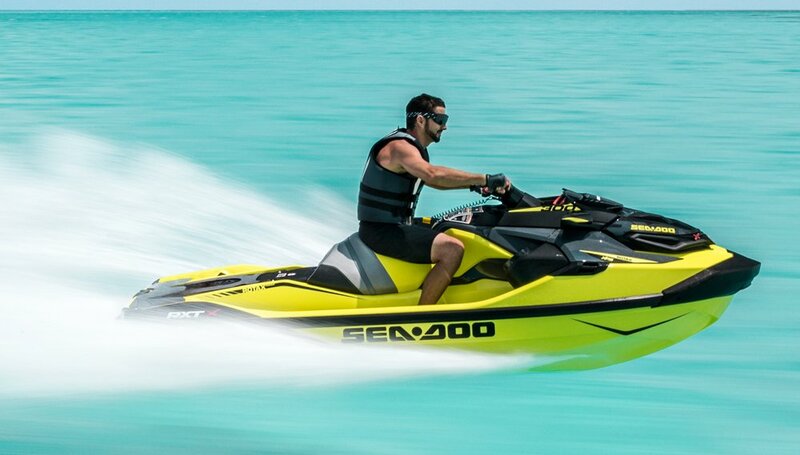 Gone is the plastic, flimsy feel that often defined Sea-Doo console pieces in the past. Everything is solid with impressive fit and finish. Five-position tilt steering remains and continues to pivot the info display in unison. The fuel fill has been moved from the quick-access cap on the exterior to a traditional screw-type cap at the back of the storage compartment. The location worries me due to proximity to the main storage, but a physical barrier (and drains to the footwells) promise to alleviate any worries about fuel spills. Moving aft, the next notable change is the saddle…and what can be done with it. In standard form it’s heavily bolstered for the driver, with one additional bolstered section aft. Ergolock-style details see that notable notch taken out so that a driver can grasp the saddle with their thighs. The aft section of the seat, however, can be removed, snapping free by pushing in two (again) very sturdy locking tabs. Removing the seat sheds additional weight for performance types, but also frees up space on an expansive back deck. It also reveals a large deck plate, secured in place by a series of Torx screws, that is easily removable and exposes nearly the entire engine and driveline for maintenance. 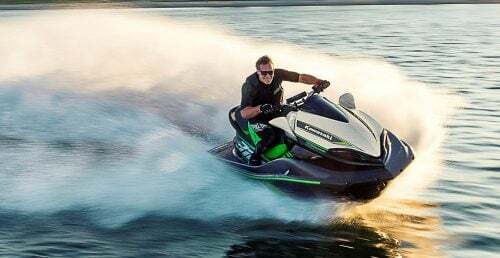 This now generous, 366-square-inch swim platform is where you’ll find Sea-Doo’s new LinQ attachment system. If you’re skeptical, it may alleviate your concerns to find that LinQ is not in fact new. The Ski-Doo snowmobile side has actually been using it for years. 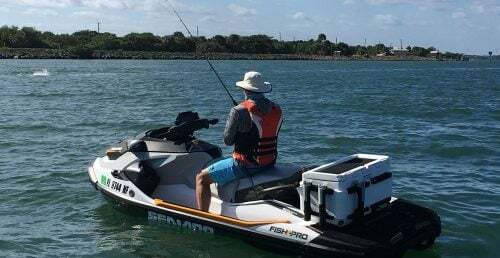 LinQ consists of dual mounts that pop up from the platform surface, onto which you can attach a variety of accessories, including a 4.2-gallon cooler, a 4.0-gallon gas caddy, and a 5.5-gallon semi-rigid zippered base that can also stack atop the gas caddy. Accessories simply slide into one of the mounts, then lock onto the other with a quarter-turn tab. Not to sound like a broken record, but again, all are surprisingly secure and free of almost any play when attached. 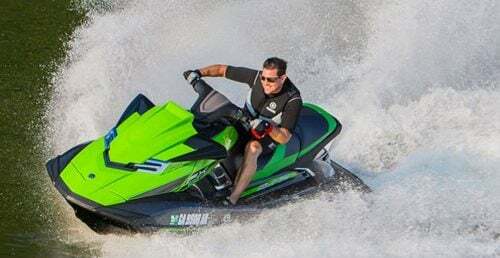 As to performance and handling, in reality the essential details of a craft that carries on the RXT-X name, expect more than the last model to bear the moniker. Within the engine compartment lies the same 1630 ACE that carried the boat in recent years, a 300hp Rotax more than up for the task at hand. Several small changes have been made for ’18, including a simpler cooling system, new channel design for more heat transfer in the radiator-like rideplate, and a larger oil cooler. Those changes, however, shed another five pounds in weight. Add the CM Tech closed-mold process and thermoform finish introduced last year (along with the low-profile deck, shorter length and redesigned seat) and the result is a boat that weighs in less than the two-passenger RXP-X. Speed should be electronically limited to about 68 mph, but I recorded higher numbers on several occasions during our two-day journey on the Colorado River. 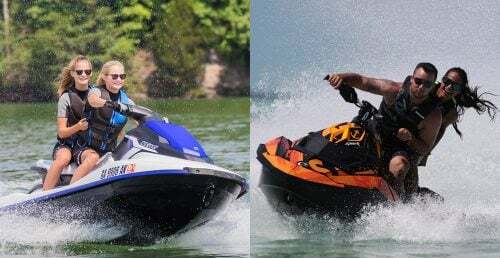 Gains are more noticeable in the mid-to-high range of the powerband, where Sea-Doo notes a 17% improvement in acceleration and a 0.5-second drop in time from 30-50 mph. On the low end, a new feature – Launch Control – is also of note. 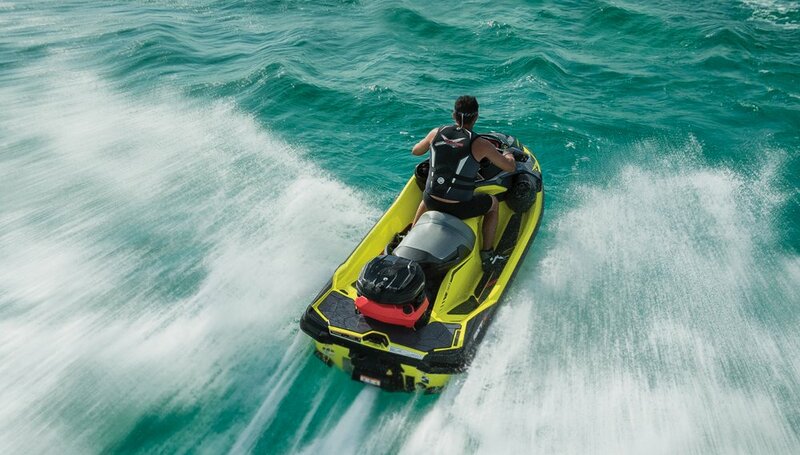 Exclusive to the RXT-X 300, it’s activated through the normal VTS handlebar control, and automatically adjusts the trim angle based on the craft’s speed, lowering it for acceleration to prevent porpoising. As to handling, the craft rails its way through turns once you give it a healthy dose of downward bow trim (now accomplished via a touchpad control adjacent to the left handgrip that also incorporated Sport and ECO mode settings). 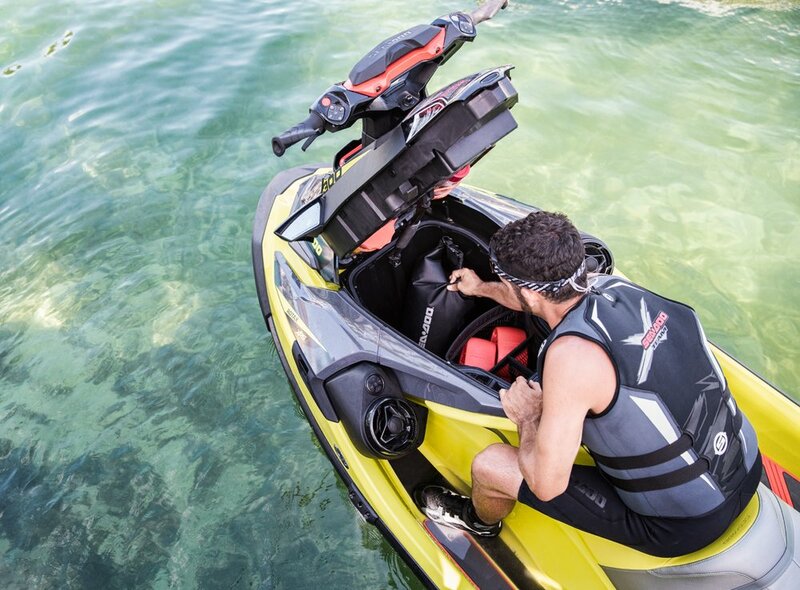 With bow low, the hull slices through corners with a newfound surgical precision that clearly evokes the RXP-X, but key to the new design, hardly suffers when things turn rough. Performance offshore types should be quite pleased. 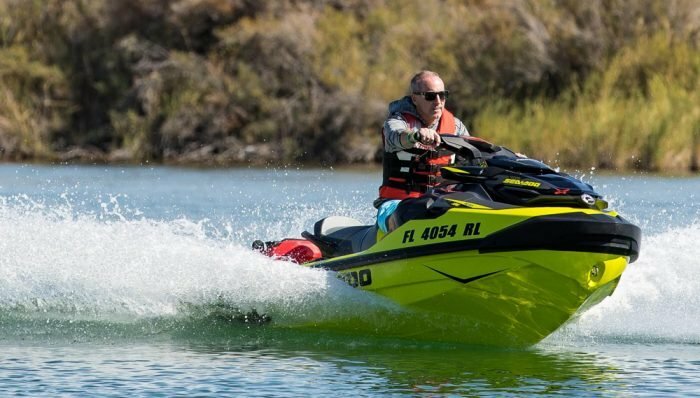 Be aware, however, that the RXP-like design can cause the bow to hunt in certain conditions, like I experienced following the mixed-up wakes of 20-odd personal watercraft down the Colorado in high winds. Again, downward trim seems to be key. I did not experience the hunting personality in any other water conditions we encountered during the length of our two-day test of the craft. iBR? 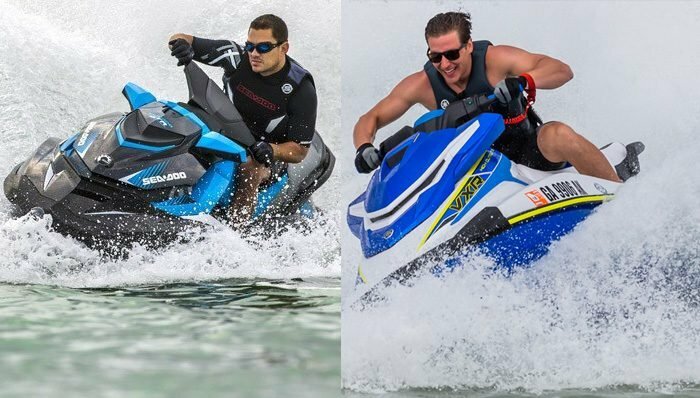 It’s still integral to any Sea-Doo, and now is on its third-generation. Key changes are a redesigned reverse gate that funnels water to the sides for better steering control when backing. Touring, Sport and ECO modes also return, as does the high-performance variable trim, radio-frequency lanyard security connection, and X-Package goodies like angled footwell wedges, sponsons, and gauge enhancements. Price? $15,699 for starters. Option it up with that Bluetooth audio system, or if you’re a more practical guy like me, those cool LinQ accessories.